I know am not regular to the small (big) world of blogging of mine as I've not settled yet. Still touring in my native place and hopefully I'll return to normal mode by very early week of next month. We've not yet started our deewali sweet making as well.. I should say thanks to many of my blogging buddies who sincerely asked my absence and left me a word.I'm really really touched and overwhelmed at the same time, in a good way. Thanks a lot gals.. Coming to the recipe, I just blindly followed this recipe but with alterations in the quantity given..It tasted great and I received some good compliments as well. Shallots/sambar onion -- 10 nos. Dry red chillies -- 5 nos. Pressure cook the thuvar dhal with few drops of oil , hing, garlic and turmeric powder until they turns soft, might take 10 minutes. 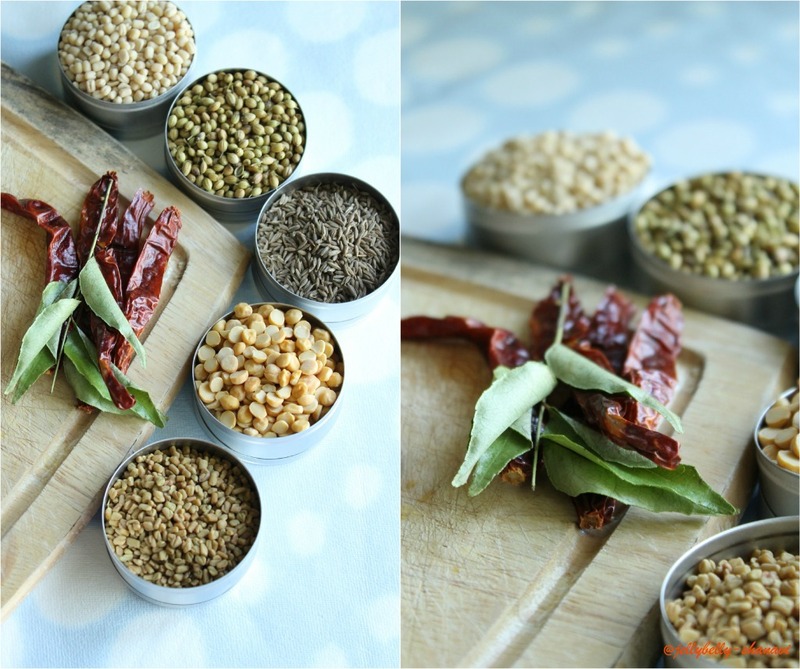 Dry roast the spices given to make sambar powder, one by one, to a slight golden brown and rest for few mts. Then grind them to afine powder and reserve for further use. Now , pour in a tsp of oil and add the shallots ,saute well. Throw in the green chillies and the tomatoes. Mix well until the tomatoes turns soft. Add in all the cut vegetables one by one and add the required salt.This would take min 7 mts depending on the veggie's used. Mix in the tamarind pulp and stir well. Add half cup of water and cook the vegetables until they turn soft to the touch. Add in the ground sambar powder and mix well with the veggie's. Give them a rapid boil.Finally add in the cooked thuvar dhal , completely mashed, to the sambar mix. Combine thoroughly and let them again boil till we do the thadka. Heat a smal pan with oil and do the seasoning with mustard seeds, curry leaves and broken chillies. Transfer the seasoning mixture to the kulambu and mix well once again . Add the coriander leaves. Switch off the stove once u reach the desired sambar consistency. Goes good with rice n all tiffin items. Sambaroda vasanai PAris varaikum varuthu...fingerlicking sambar,my fav.. Delicious flavorful sambar...love with idlis..
thats a very nice click and pic....yum! 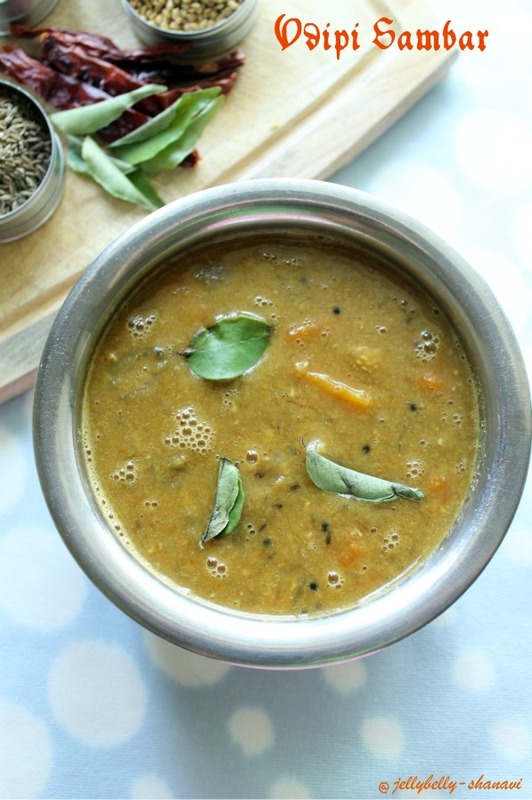 Sambar looks so delicious and mouthwatering. Excellent preparation. Sambar luks so yumm and flavorful.Deliciously presented Shanvi.Luv it. This sounds wonderful, looks delicious! OMG .. looks very tempting and delicious.. Welcome back! Udippi sambar is super. Super clicks too. 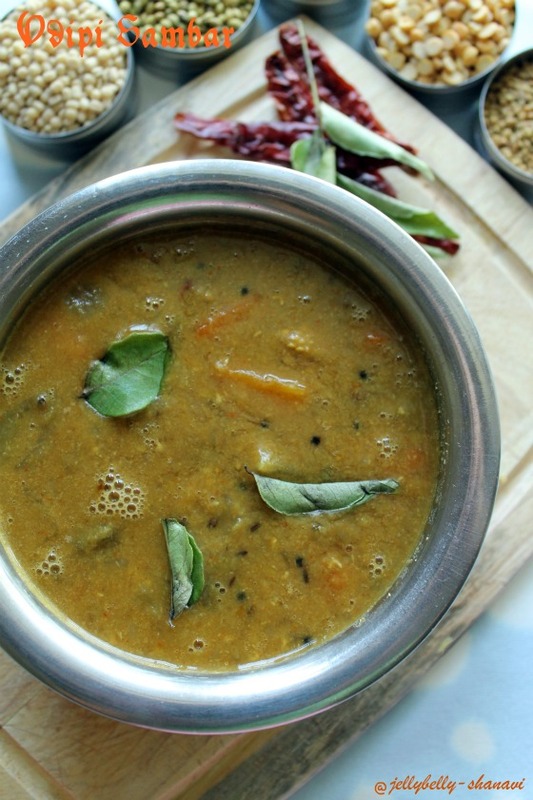 looks really delicious...will try this recipe next time..
wow...sambar looks just so yummy ! great presentation ! Nice to see u back like me..Luv the click on spices..Yummy sambhar..
yummy! I think the garlic and the green chillies is what makes this different! 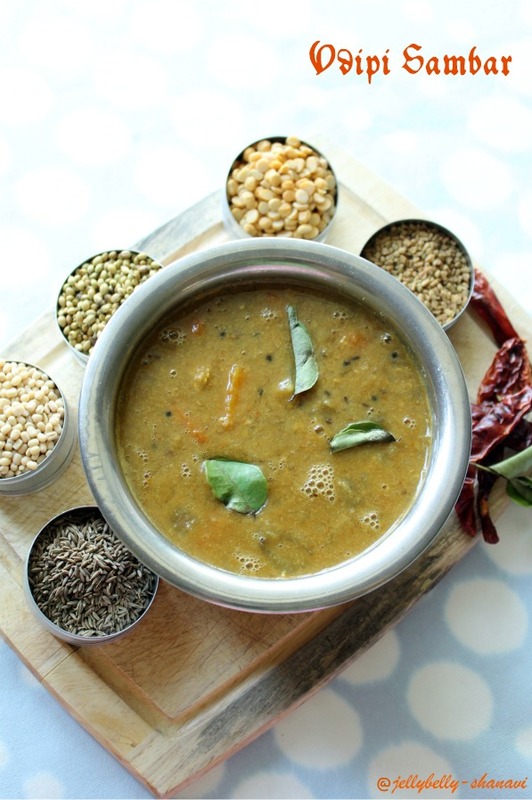 Fantastic clicks and mouthwatering sambhar. Thanks for dropping by simply.food. looks great first time here nice place and love to follow you.. I hail from the neighbourhood place and i feel so much being at home..